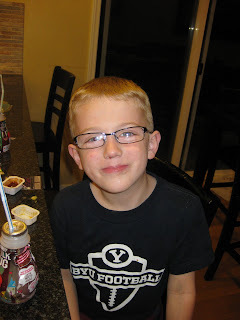 Jackson finally had his birthday after months of waiting and asking! The cake, no I did not make it. I was going to attempt it but decided that for my own sanity and Mike's sanity I would just order it this time. Jack and Luke building their Lego racers All the boys. We had his party the Friday before his birthday we got to celebrate again on his actual birthday. Since the day was going to be busy and Hailey had soccer practice until 6:45 we decided to have presents and "cake" on the morning. Let's be honest Jackson could not wait any longer either. Who is more excited Jackson or Hailey? 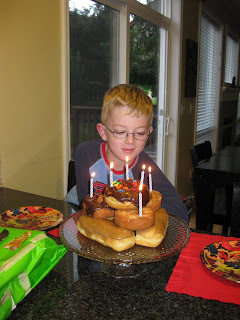 Jackson's cake this year was made of donuts, he loves maple bars! 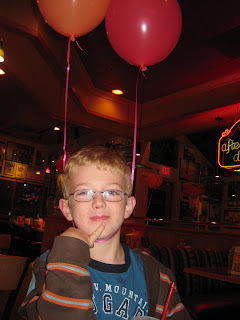 Jack at Red Robin with the signature balloon ears! 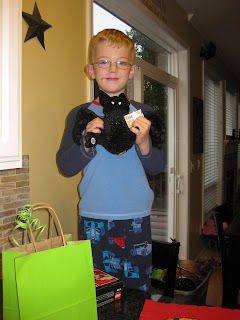 New webkinz which he named Vincent the Vampire Bat Had to include this picture of his new glasses-Cute Boy!!! Love you Jackson!! !